Tired of backwards EnderDragons? Upward looking chickens? Or some of the other bugs in MobDisguise? Ready to try something brand new? With DisguiseCraft we are taking a brand new approach on mob/player disguises by taking advantage of the advanced features released in the 1.1-R4 build of CraftBukkit! No Backwards EnderDragon! No messed up chicken head! These commands can all also be run from the console. You just need to specify the player name right after the /d or /u. Planned or ToDo <== Put suggestion comments over here! Dev Builds (Jenkins) <== Contains the latest DisguiseCraft builds! Or, how to make it so that you don't see the nametag of the person inside of the disguise! 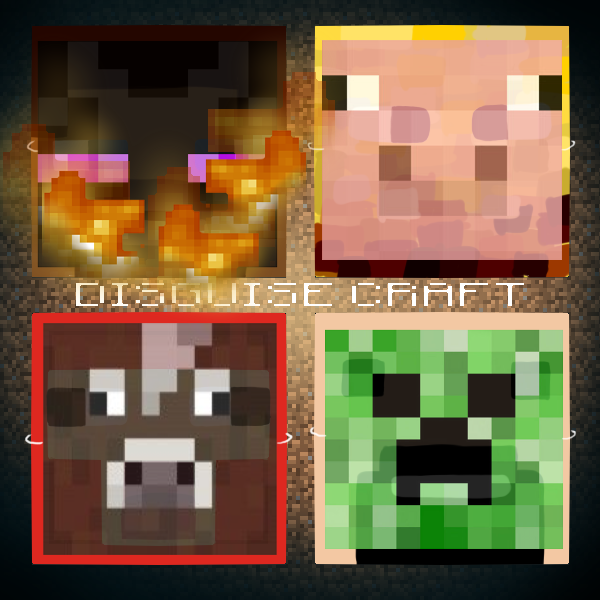 Add the permission node "-disguisecraft.seer" to the group that is seeing the double disguises! Be sure to read our Frequently Asked Questions section. Report errors using the ticket system and be sure that you are using this plugin with the CraftBukkit build that it supports. Any error reported in the comment area may be deleted and ignored. Also make sure to check your tickets often and report in when a build or release has fixed the issue. We will only release for stable CraftBukkit builds. Do not report errors when using our plugin with a build it was not listed to support. Because we need to recompile for each specific build, you will only ever see versions for CraftBukkit Dev builds in our jenkins. Let me support to 1.8.8, please!! is there anyway to run this plugin in a server that is specifically 1.8? Is this plugin compatible with 1.9.4 and CreativeControl and Villagers can farm when this plugin installed? does the latest dev build work on 1.9 ? It doesn't appear to load for me. Looking forward to a 1.9 release! A brilliant plugin. Oke, thanks for the progress. Is there any 1.8.8 build? The 1.9 data watcher is causing some issues for me. I'm still trying to figure it out and how to handle it. Is there any status on the progress of the update to 1.9? Thank you :) Awesome plugin! Thanks Tux2. We will wait patiently as you work on the coding. I know coding can be VERY tricky. Good luck. So... it's been a week now. How's it going so far? Thanks for working on a update :) also thats okay we don't mind the bugs as long as we know your working them out thanks! Thank you Tux2. I am glad this is being worked on. Looking forward to the 1.9 update!! !